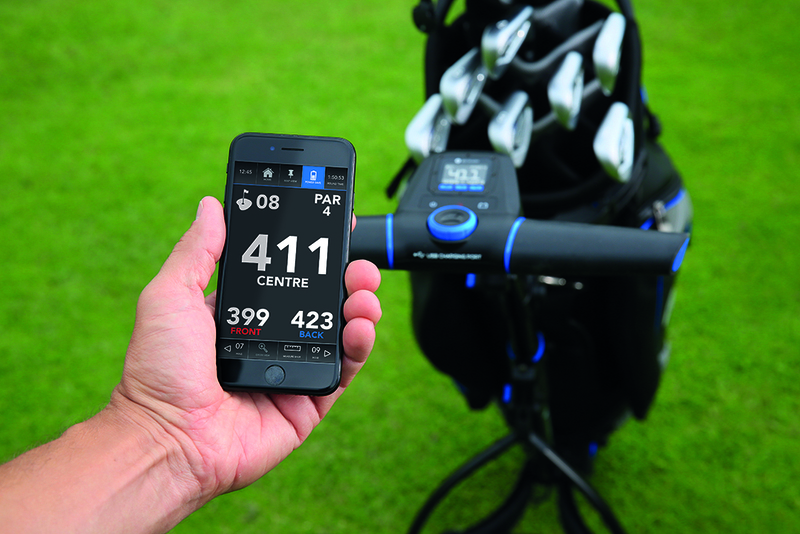 Motocaddy has unveiled its most technologically advanced model, along with a free GPS app that connects to the trolley providing distance data and mobile alerts at over 36,000 courses around the world. The S5 Connect trolley can be synced to the Motocaddy GPS App via a Bluetooth connection on any compatible smartphone; allowing the trolley’s digital display to be used in place of a conventional GPS, offering golfers front, middle and back distances to the green (in yards or metres), along with the par of the hole, clock and round timer. The digital control button works in the same way as other Motocaddy models, regulating the nine speed settings and stopping and starting as required around the course. It can also receive and display notifications alerting the golfer to missed calls, text messages, emails or range of app alerts, including WhatsApp and Facebook. The smartphone can remain connected, even when securely placed in a golf bag pocket or being charged using the trolley’s patented USB charging port. “It acts as the ultimate caddy for any golfer out on the course - carrying your bag and giving you accurate yardages on each hole. “The first iPhone was launched a decade ago and since then a lot has changed in golf technology. We’re not encouraging golfers to keep checking their phones during play. On the contrary, the smart trolley could reduce phone use, because it tells you all you need to know and can be pre-set to let you focus on your game. It’s also incredibly easy to use and notifications can be switched off if needed,” he added. 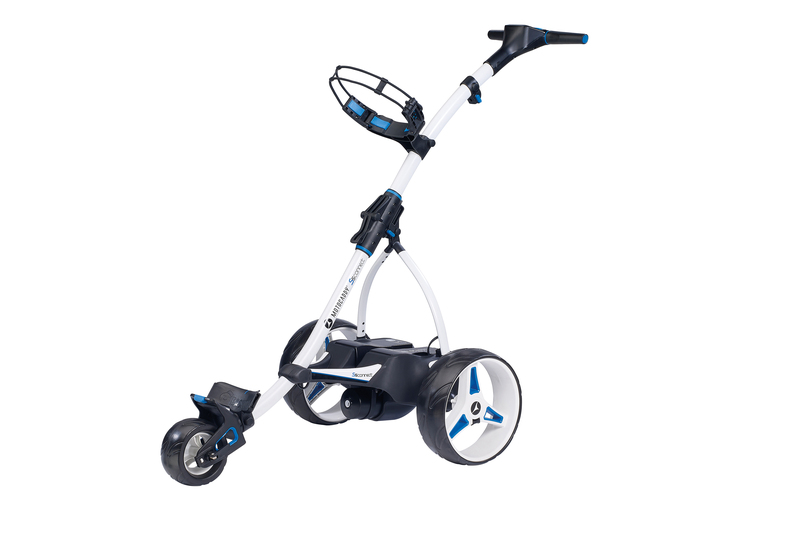 The S5 Connect includes the modern look and features found on the latest Motocaddy S-Series models - including a soft-touch ergonomic handle; streamlined battery tray to accommodate the full range of Lithium batteries; the exclusive super-fast QUIKFOLD mechanism; low-profile, quick release wheels; Adjustable Distance Control (up to 50 yards) and compatibility with the brand’s popular EASILOCK bag-to-trolley connection system. The trolley is also available in a Downhill Control version. The S5 Connect DHC model maintains a constant speed while moving down a gradient - thanks to a special motor that adjusts power output automatically to control the rate of descent – and offers downhill breaking coupled with an electronic parking brake to hold its position on the steepest slopes. The brand’s first-ever mobile phone app – available free to download on iOS and Android – features a number of easy-to-use modes and can be used independent of the trolley as a fully-featured mobile GPS device. Through the app’s ‘Play Now’ mode, some 36,000 courses worldwide are accessible with overhead maps and detailed yardages, distance of the last shot and dedicated greenside information. A ‘Shot Planning Control’ pinpoints distances to any point on the golf course; while the local course search and automatic hole advancement enables the app to move between holes and view the lie of the land during play. Preserving battery capacity, the ‘Power Save’ mode provides front, middle and back yardages, plus a round timer, clock, hole number and par. “We’ve partnered with the world’s leading golf GPS mapping company in the United States to provide the most advanced technology ever found in a combination of a golf trolley and mobile phone app,” said Webb. “The app has the added ability to pre-load the course on Wi-Fi before you leave the clubhouse, so if you’re away on a foreign golfing holiday, you can continue to access GPS information without having any data roaming turned on. It also provides maximum portability, as the app can be taken anywhere on the course – even back tees on par 3s,” he added. Available in five different languages (German, English, French, Spanish and Swedish), the app is available to download from the Apple App Store and on Google Play. In addition to its wide-ranging GPS features, the app includes a support section with links to the Motocaddy website, a check for recent updates, mapping requests, instruction manuals and app specific FAQ’s. The S5 CONNECT will be available from June 2017 in Black or Alpine at £549.99 with Standard Lithium Battery and £599.99 with Extended Lithium battery. The DHC model will be available at the same time in Graphite at a RRP £599.99 (Standard) and £649.99 (Extended). All battery options now include a full five-year warranty.